In recent years, we've seen cross-country-style protective gear and apparel evolve to meet the capabilities of the sport's super-versatile trail bikes. Increased head coverage and new safety technologies are top priorities in today's helmet designs, and the new Giro Chronicle MIPS targets both of those factors. Similar in style and intended use to the brand’s Montaro helmet ($150), the Chronicle is geared toward the rider looking for modern protection in the $100 range. Those familiar with Giro lids may notice the Chronicle doesn't employ the anti-microbial padding, POV camera or light mount, or the goggle strap grippers found on the Montaro, but it does pack a MIPS liner. The Chronicle has extended coverage at the back of the head to match the current crop of deep-coverage helmets, and Giro's multi-position visor is fully adjustable, even going high enough to allow unused goggles to sit underneath it. The adjustable retention system provides a quickly tuned fit via a dial at the back of the helmet, while 14 vents move air through the EPS shell. My size medium Chronicle MIPS helmet weighed 385 grams, which is typical for a MIPS-equipped helmet at this price. For those not up on contemporary helmet technology, MIPS is basically a thin plastic sheet between the helmet’s EPS foam and the rider's head. The MIPS liner is designed to allow the helmet to slide relative to the head during an impact, theoretically reducing the rotational forces believed to be a factor in causing concussions. In comparison to similar designs from other brands, Giro’s retention system has a wide range of vertical adjustment, and dialing in the ideal fit is quickly achieved by turning the tiny Roc Loc dial. Although most people don't wear goggles when riding mid- or long-travel trail bikes, those who tend to go full enduro will appreciate how the visor can be tilted upward to reveal goggle-stashing real estate, ideal for uphills or trail-side chitchat. The Chronicle has a long visor, and one of my pet peeves is a visor that interferes with my peripheral vision. It took some rejiggering, but I eventually found a sweet spot where the visor was outside my line of sight while set in the lowest position. The Chronicle’s 14 vents did a fine job of channeling air throughout the helmet, and its padding was super absorbent and comfortable. The all-mountain helmet category is saturated with unique offerings, and the Chronicle’s performance and features are on par with many more expensive helmets. 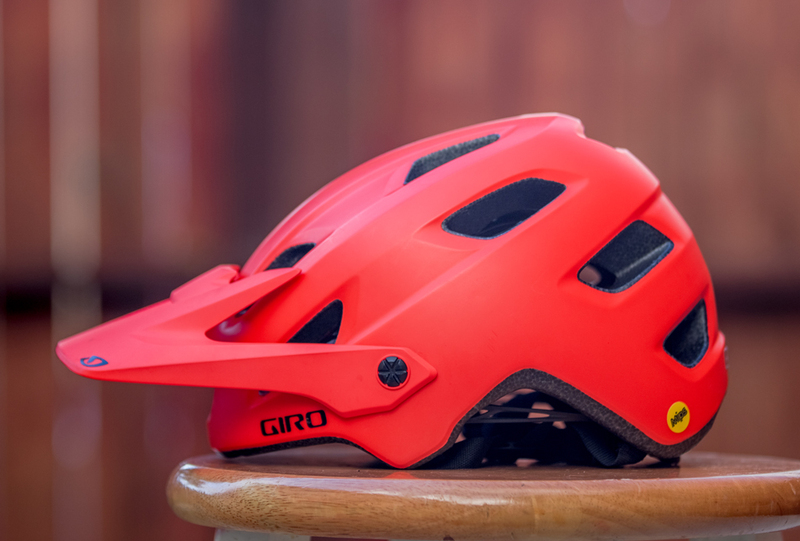 Riders in the market for a comfortable lid that utilizes the latest safety technologies and offers a wide range of adjustability will find Giro's latest offering a trail-worthy contender.